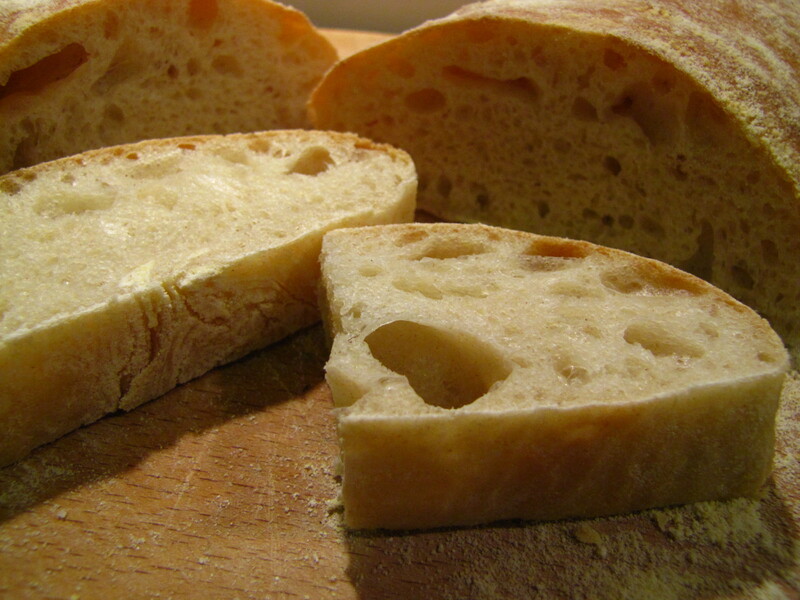 As far as bread goes, Ciabatta is very much the new kid on the block having only been around in it’s current form since the middle of the ;last century. Like many artisan breads, this uses a 2 stage process by first creating a pre-ferment, sponge or ‘Biga‘, which means you need to plan ahead. The pre-ferment is made the day before and forms a vital element in the bread’s fermentation process, even though it is supplemented with a second body of dried yeast later on. The pre-ferment I created here stood in a cool utility room overnight, and should used at room temperature. If your room is warm, you’ll probably need to use the pre-ferment quicker than I did or refrigerate it or else it will burn itself out! Clear a large work surface and heavily flour, ideally with a mixture of semolina flour and pasta flour. More white bread flour will be fine.